The basics are always important, regardless of where you are in your career as a physical therapist. As a student, I am just now beginning to realize how important it is to never forget the basics. This became particularly apparent to me after learning about joint arthrokinematics. As PTs, we are not able to open our patients’ joints when we want to see how they are moving through their available range of motion. Therefore, when it comes to the joints, it is critical that we understand all of this roll and glide nonsense. After all, rolls and glides are the basic motions that feed into more complicated movement patterns. I am a visual learner. When I first learned about joint arthrokinematics, I had to figure out a way to visualize joint movements even though I couldn’t physically observe motion through the skin or muscles. I imagined a ball rolling along the inside of my cupped palm. The ball is round, but in terms of arthrokinematics, the ball is considered convex. My cupped palm creates a concave surface in which the convex ball can fit - just like a joint. 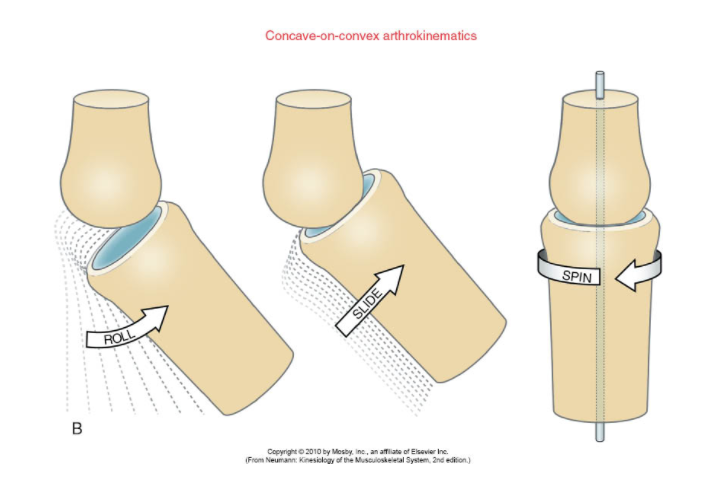 Let’s visualize the “convex on concave” rule of joint arthrokinematics. First, grab a ball or a balled up piece of paper. Then roll the ball along your palm, starting at the base of your palm and moving up toward your fingertips. There will be a point at which the ball will roll out of your hand. This is exactly what happens in the joints too. However, instead of the ball rolling out of the joint and dislocating, there is a counter-motion to restrict excessive motion (hopefully). This counter-motion is known as a glide (AKA a slide). Now glide the ball back towards the palm of your hand (in the opposite direction from which you rolled it). This is what occurs when any convex joint surface moves on a concave joint surface. According to the "convex on concave" rule, the roll and glide occur in OPPOSITE directions. Next, let’s visualize the “concave on convex” rule. Cup your palm and hold the ball still. Instead of moving the ball, move and roll your palm around the stationary ball. As your palm rolls around the ball, it also glides in the same direction. There is no need for a counter/opposite glide here because the concave surface will continue to move around the convex surface. So, when a concave joint surface is moving on a convex joint surface, roll and glide occur in the SAME direction. If you understand these basic arthrokinematics, then the hard part is done. The next step is knowing the different joint surfaces. This allows you to determine whether the motion is convex moving on concave, or concave moving on convex. You may spend time memorizing the different descriptive terms for each joint, but to be honest, I never use specific names. I focus more on remembering each of the joint surfaces. Take the knee (tibiofemoral joint), for example. The knee is referred to as a condyloid joint. However, that tells you nothing about the surfaces of the joint. 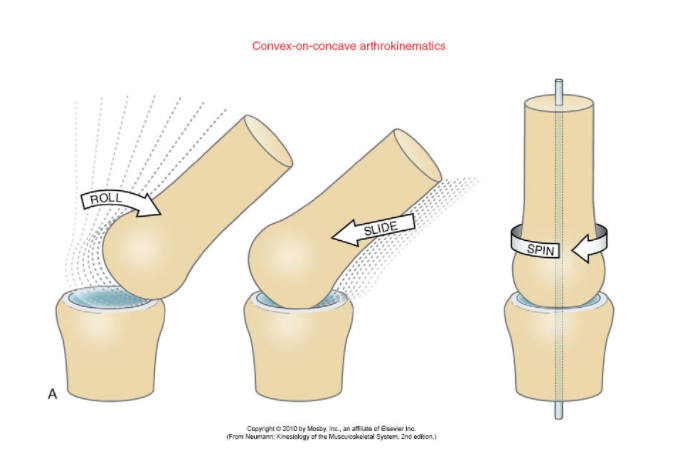 In this case, the femur is the convex surface and the tibia is the concave surface. In all honesty, I had to look up the specific term, condyloid joint. However, without looking, I knew the surface types of the femur and tibia and I was able to understand how they move. A long arc quad exercise is performed with open chain knee extension. When trying to understand the joint arthrokinematics for this exercise, I first ask myself to identify the surfaces of the joint. Which surface is convex and which surface is concave? Which surface is stable and which surface is moving? At the tibiofemoral joint, the tibia is a concave surface and the femur is a convex surface. During a long arc quad, the tibia moves on a stable femur. Therefore, the tibia is rolling and gliding in the same direction on the femur. A squat is performed with closed chain knee flexion. The femur is a convex surface and the tibia is a concave surface. During a squat, the femur moves on a stable tibia. The femur rolls posteriorly and slides anteriorly on the tibia. The roll and glide/slide occur in opposite directions, according to the “convex on concave” rule. When evaluating and treating movement impairments, it is important to understand joint surfaces, which joint surface is moving, and which joint surface is stable. Then you can identify if the roll and glide are occurring in the same direction or in opposite directions. We can use these simple explanations of joint motions when educating our patients and clients about range of motion and joint restrictions. 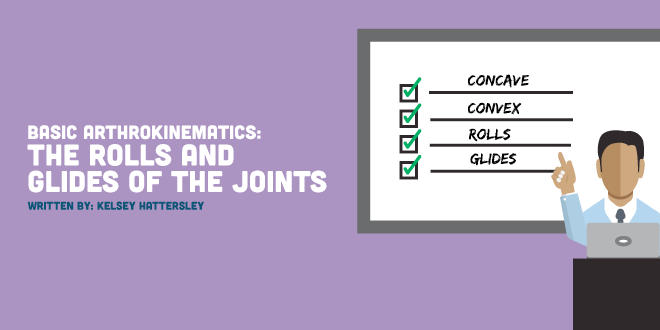 While it is easy to use PT jargon with other physical therapists, we must be able to break down arthrokinematics to our patients in a simple and digestible manner. While these arthrokinematic explanations may seem oversimplified to a seasoned PT, they are useful when first learning joint arthrokinematics and when educating our patients. It is key that both the patient and the physical therapist are able to understand and effectively communicate basic concepts and principles of movement. Neumann, D. A., & Kelly, E. R. (2010). Kinesiology of the musculoskeletal system: foundations for physical rehabilitation. St. Louis: Mosby/Elsevier.